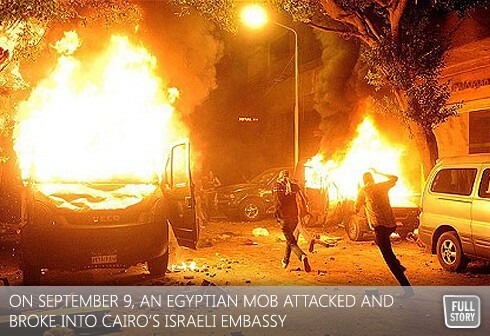 By Howard English--On the evening of Friday, September 9, an Egyptian mob of an estimated 5,000 people attacked and broke into Cairo’s Israeli embassy. Fortunately, the security guards survived inside the embassy “safe room” and were eventually assisted by Egyptian commandos. Israel sent a plane to rescue other embassy staff, including the ambassador, Friday night. The Centre for Israel and Jewish Affairs, the advocacy arm of UJA Federation of Greater Toronto and other Canadian Jewish Federations, condemns the attack. The Centre said that Egyptian authorities should reaffirm both their responsibilities under international law to protect Israeli diplomats in Egypt and their commitment to maintenance of the Israel-Egypt peace treaty. The Israel-Egypt peace treaty of 1979 is a cornerstone of Middle East stability, and the benchmark for Arab-Israel peace diplomacy," said Centre board Chairman David Koschitzky. "Its maintenance is important not only to Israel, but to all those worldwide who wish to see a long-term and stable process of broader Arab-Israeli reconciliation." "Like all Canadians, the Jewish community watched last winter's political changes in Egypt with a mixture of hope and concern," continued Koschitzky. "The Israel-Egypt treaty has stood for more than thirty years. Maintaining it is critical to the international credibility and legitimacy of the new Egyptian government. To a great extent, the Egyptian revolution of the past year will be judged by its handling of its important relationship with Israel." According to Israeli Prime Minister Benjamin Netanyahu, who expressed appreciation to U.S. President Obama for his support, Egyptian commandos for their help and Egypt’s Information Minister for condemning the attack, Israel will continue to adhere to the peace treaty with Egypt and Israel’s ambassador will quickly return to Cairo. Noting Prime Minister Harper’s statement, Centre CEO Shimon Fogel expressed his hope that Canada will use its diplomatic contacts with Egypt to reinforce this expectation, including proper Egyptian supervision over the Sinai Peninsula which borders both Egypt and Israel. “The Sinai must not become a staging ground for terrorist actions against Israel,” he said. Fogel went on to note that Egyptian state-controlled media regularly broadcasts material that incites hatred of Jews and Israelis. "The broadcast of anti-Semitic and inflammatory material encourages violent incidents like the one we saw Friday," added Fogel. "Canada can use its influence with Egypt to encourage a change in this policy". Howard English is the Senior Vice President, Greater Toronto Region and University Affairs, Centre for Israel and Jewish Affairs.